It’s late and I’m in my office. Rain paws at the window like a vagrant washing a windshield. Old wounds and memories fade further away as I take another shot of whiskey. Slowly I glance between my handgun and a pile of OC80s- wondering which will kill more pain- when she walks in. She was gorgeous. A little bottom heavy, but curvy and voluptuous in just the right way. Her dark hair flowing like the River Styx- constant and ominous- yet perfectly contrasting her red dress. Her face was Christmas in Oz- ruby lips and emerald eyes. Maybe too much eyeliner, but how would I know? I pick up my head, trying hard to keep my eyes focused and hide how intoxicated I truly am. She glares at me with enough contempt I have to blink hard to verify she’s not my wife. I notice a Blu Ray under her shoulder. She’s got moxie, that much I’ll give. “That’s all I ask...” She heads toward the exit. I look at the game on my desk: L.A. Noire. Not a bad choice. “Oh, and Ninja?” She calls from the doorway. “Maybe you’ll get better responses if you try writing about games people care about and don’t waste time writing a long opening pretending to be in a Noir film.” And the door shuts. I guess some habits die hard. 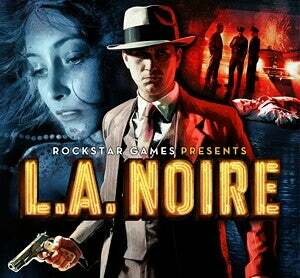 L.A. Noire is an open-world detective game, featuring a traditional noir story, set in a mostly accurate portion of 1947 Low Angeles. It was the first and last game developed by Team Bondi, and was published by Rockstar in 2011 for the PS3 and 360- with a port for Windows handled by Rockstar Leeds. The game utilizes a proprietary facial mo-cap process known as MotionScan which uses 28 cameras, running at 1000fps, to capture an actors face, from every angle, without need for markers/dots. This process (developed by Depth Analysis, a sister-company of Team Bondi) allows all the characters in-game to have unprecedented levels of realism (as far as faces go), from speaking to facial expressions. Look, I’m a sucker for a good Noir story, and L.A. Noire is a great one. I won’t spoil it, but suffice it to say that all the trappings are here. Shady cops, 1940s LA, freeway construction, housing developments, corruption to the highest...it’s all there. The only thing missing is a Femme Fatale (which is probably for the best). Players take control of Cole Phelps, a by-the-books, no nonsense, War Hero looking to make the world a better place. Starting as a beat cop patrolman, and climbing through the ranks to Detective with just his uncanny ability to investigate a crime, nab the right perp, and piece together the larger picture...if not always the FULL picture. The map is sprawling and accurate. If you know LA (at least, the portion from the game) you could probably make your way around no problem...other than the game taking place in the 40s and before the freeway was built. It’s nice though, and checking out landmarks is coolbeans. Gameplay is fantastic. This game is clearly a Rockstar game, even if it isn’t. Shooting is fine, no problems there. I do wish Cole could take as many bullets as it seems enemies do, but I’m fequently out of cover and at least getting shot doesn’t stagger the player like it does the enemies. Cole’s hat can get shot off. If you find it, you can put it back on. I like that there is an option to aim at a running perp and fire in the air to stop and arrest them instead of gunning them down like you were some kind of...cop. Driving is as smooth as the face of celebrities in a ProActive commercial. Every vehicle handles differently, but none handle poorly. It’s not often (if ever) that I would get mad at the game for a car crash. Since the year is 1947, there is no GPS. Instead, there is an option to ask your partner for directions. There’s also the option to let your partner drive if you’re not feeling it, and that’s totally a plus. But none of that is important. No, the best part of the game is investigating. Say you’re called to a murder, hit & run: When you arrive, you speak with the officer who found the victim and the coroner. Then you investigate the body for signs of what caused the death, and who they are. Search around for more clues (noted by a chime) until you’ve found them all (you know when because the crime music stops). Once you have all clues, talk to any witnesses. Eventually you’ll have new POIs (Person of Interest). Talk to those people, and search around their place, and you’ll wind up with suspects. Interrogate the suspects at the station, charge one for the crime, and you pass the mission. More points are awarded when you arrest the person that most fits the evidence. Now, that’s the broad strokes. I didn’t go into detail for questioning/interrogations because they deserve their own section. The face tech is lovely. Every wrinkle, crease, and movement- from forehead to neck- is captured. This means that when questioning a suspect (or even witness) you’ll have to pay attention to their expression and judge whether it’s the truth or a lie. If you believe (they put a man on the moon...) the perp is telling the truth, then, in a revolutionary new gameplay achievement, you select Truth. If this is correct you’ll get more details, if not you’ll get a smug SOB. If you think the perp is lying to your face, and have evidence to prove it, you select Lie. Then, as liars are wont to do, they’ll aggressively ask you to prove it. At that point, you go into your notebook and through the clues to find the piece of evidence proving them wrong. Get it right, get more deets. Get it wrong, and you could end up letting a guilty party walk home. However, if you ask a question and the perp gets all shifty-eyed and twitchy but you have no PROOF they’re lying, you call them into Doubt. This way, your detective let’s them know you know they’re big fat lying liars with smoldering breeches, but without making any accusations. Again, get it right/wrong same as above. From the moment a captain hands Phelps (& Partner) a case to the moment a perp is charged with the crime, the game is at its best. It’s funny because, mechanically speaking, this game could absolutely be described as “utterly repetitive”. I mean, once the tutorial ends and Cole is promoted to Detective, you know the basics. No case truly breaks formula, yet each one is different from the last. Even the Dhalia murders, which are all the same MO, are distinct (oh yeah, btw, YOU SOLVE THE BLACK DHALIA CASE, though it doesn’t matter narratively as much as it seems at first). I don’t have a perfect sequel in mind, so here’s a collection of ideas. ·Remaster the game for current gen systems. This would be great. They could release it and include the DLC that was launched, along with the 11 missions (& 2 departments[!!]) that were cut. ·Drop MotionScan. As great and mind blowing as the facial movements in this game are, it doesn’t take too long to notice it’s a video over custom model rigging. Teeth alternate between being real and being painted on a flat surface as mouths move, eyes are noticeably painted/projected over the sockets, there’s a slight fade in/out when the animation loops. Rockstar would be better off using standard mo-cap for this (especially since the new consoles can handle more polygons/animations) and painting wrinkles/creases where they’re needed. ·Add Euphoria. In their review of the game, IGN claimed characters were “dead from the neck down”. I don’t really agree, but I know what they mean. The first time I played, the heads seemed like real people’s stuck on a PS3/360 body. I think some of this could be solved if, instead of standard animation, the game used mocap and a physics engine like Euphoria to create more natural, lifelike movement. ·Change Coasts. Los Angeles was a perfect world for this type of game, especially given the time period. But I don’t think it would work to set EVERY “Noire” game in LA. For a sequel, I would love New York, same time period. ·Give better free play. This game has no free roam option as you play through the story. Once one mission ends, a new one starts. You CAN free roam, but it feels wrong- like you could miss a perp or important info for taking too long. Give the option to visit missions like GTA (or any other open-world game) does. ·Combine LA Noire with Max Payne. I know Max has had a trilogy of games to tell his story. I know it wouldn’t make sense. But I don’t care. Move the “Noire” series to the East Coast. Keep the time period. Use the investigation of LAN with the gunplay of Max Payne and the open world of GTA. Maybe he’s Max’s father. Maybe it doesn’t matter. I mean if Jumpstreet and MIB can crossover, then two great Noir stories should be able to, right? That’s all today. Have you played this game? Do you agree or disagree? Have any ideas for a sequel, or reasons there shouldn’t be one? Just hate my guys for no reason? Leave a comment!